Former Manchester United star Patrice Evra revealed messages exchanged between him and Juventus talisman Cristiano Ronaldo, which depicted insane levels of confidence of the five-time Ballon d'Or winner. After succumbing to a 2-0 defeat in the first leg at the Wanda Metropolitano against Atletico Madrid, Juventus hosted their Round of 16 rivals in Turin with a huge task of overturning the deficit. Although there was little chance of mounting of comeback against a solid defensive side like Atletico, Cristiano Ronaldo took matter in his own hands. 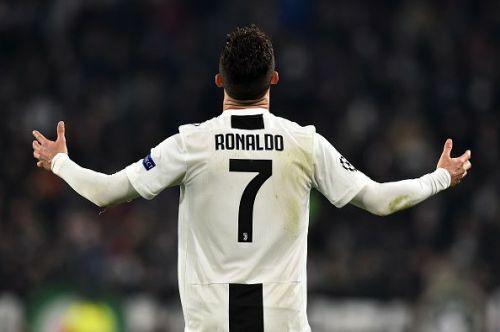 The 34-year-old forward stole the headlines and singlehandedly knocked Atletico out of the Champions League, confirming Juventus' qualification into the quarter-finals. The Portuguese star netted a hat-trick which comprised of two spectacular headers and a penalty kick in the dying moments of the game which secured the comeback. Ronaldo again reminded everyone that everything is possible with a player like him in Juventus' ranks. Atletico Madrid are obviously the bitter rivals of Ronaldo's former club Real Madrid and remains one of his favorite victims as he has scored 25 goals against them. It was also Ronaldo's 8th hat-trick in the Champions League and 125th goal, extending his lead at the top of the all-time top goalscorers list in the competition. Former Manchester United defender and Ronaldo's ex-teammate, Patrice Evra, revealed a WhatsApp Chat between both the stars. Cristiano predicted that Juventus are going to smash Atletico, which again shows the insane confidence levels of Portuguese talisman. Evra posted on his Instagram account, revealing their conversation which took place a few days before the crucial clash between Juventus and Atletico Madrid. "Bro I'm counting on you for the Champions League return," Evra said wishing luck to his former teammate which prompted a reply from Ronaldo. Ronaldo showing no signs of pressure replied: "We're going to pass bro, (at) home we smash them." The draw for the next round of the Champions League will be held on Friday. Juventus will look to extend their lead in Italy as they face Genoa in the Serie A.